Laozi, better known as Lao Tzu, was a legendary philosopher of ancient China who is probably best described as the author of Tao Te Ching. Known also as the unofficial founder of philosophical Taoism, he was considered by many as a religious deity. 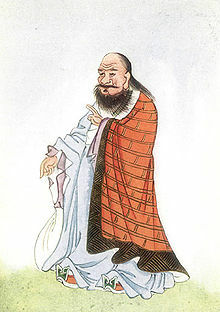 Born sometime in the 6th century BC (possibly the era of Confucius), Lao Tzu is more of an enigma than a historical figure: Some scholars would argue that Lao Tzu may in fact be more of a legend than a man, as historical information of his life and work have been passed down through the generations as lore with very few written records. The Tao Te Ching is the strongest evidence of his existence. The story goes something like this: Due to political unrest and chaos, Lao Tzu, already a famous philosopher, decided to leave the lands he called home. Apparently he was travelling westward on a water buffalo when he came to the Han Gu Pass, which was guarded. The keeper of the pass realized Lao Tzu was leaving permanently, so he requested that Lao Tzu write down some of his wisdom so that it could be preserved once he was gone – hence the Tao Te Ching was born (at least in some facsimile) and the philosophy or religion of Taoism was born as well. It is hard to condense Taoism into a couple of sentences for blog purposes. Much like many eastern philosophies, Taoism emphasizes living in harmony with a particular path or principal. Taoist ethics may vary depending on the particular school, but the path is one of action through non-action including qualities of naturalness, simplicity, spontaneity, and the Three Treasures: compassion, moderation, and humility. Lao Tzu quotes are seen posted across Twitter and Facebook on a regular basis. I have posted many of these quotes myself on the Responsive Universe. At first interpretation, you would think such wisdom is contemporary in nature. Yet, Lao Tzu’s words and wisdom span over 2500 years. As with the likes of Plato, Aristotle and even Rumi, it is fascinating to think that ancient philosophers had a steadfast grip on energy, illumination and spiritualism when science was still in its infancy. I am actually surprised we are not more evolved (spiritually and socially) knowing what these ancient teachers knew thousands of years ago. « Was Einstein a Buddhist?